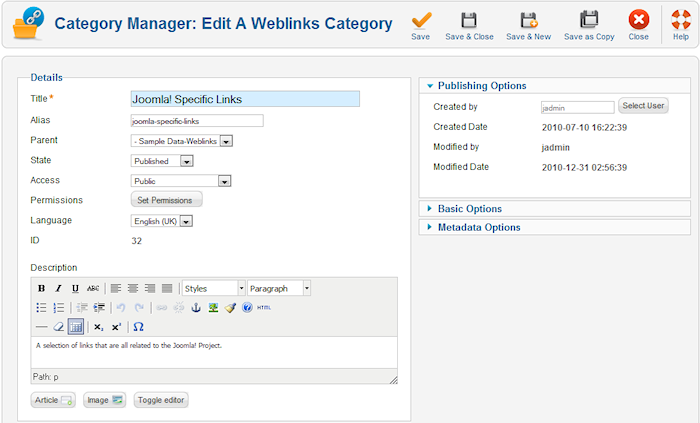 Navigate to the Web Link Category Manager. To add a new Web Link Category, and click the "New" icon in the toolbar. To edit an existing Web Link Category, click the Category's Name, or check the Category's checkbox and press the "Edit" icon in the toolbar. This is where you can add a new Web Link Category or edit an existing one. Note that you need to create at least one Web Link Category before you can create a Web Link. Also, Web Link Categories are separate from other types of Categories, such as those for Articles, Banners, and News Feeds. Parent. The item (category, menu item, and so on) that is the parent of the item being edited. Created by. Shows the user that created the item. Click the 'Select User' button to change the value. Created Date. Shows the date the item was created. Click the calendar icon to modify this date, or type in a date and time. Modified by. Shows the user that last modified the item. Modified Date. Shows the last date the item was modified. Image. Choose an image to be displayed with this item/category in the front-end. Meta Description. Optional text entered here will be added to the page's HTML output and may be displayed in search engine results. Robots. This will be added to the page's HTML output. 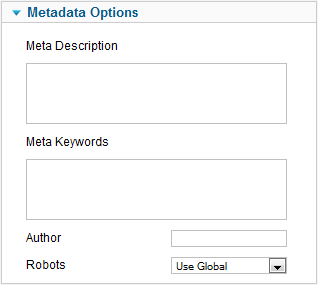 Options are: Use Global, Index-Follow, No index-Follow, Index-No follow, No index-No follow, and Don't display robots tag. This section is where you can view and edit permissions for items that are part of this category. Edit Own. Grants users the right to edit objects that they created themselves. Inherited. 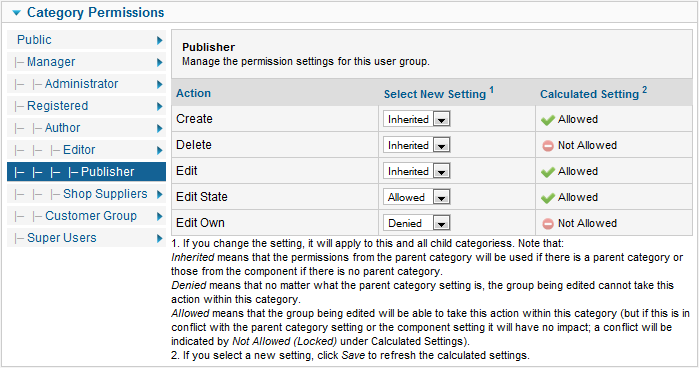 Permissions from the parent category will be used if there is a parent category or those from the component if there is no parent category. Allowed. The group being edited will be able to take this action within this category (but if this is in conflict with the parent category setting or the component setting it will have no impact; a conflict will be indicated by Not Allowed (Locked) under Calculated Setting). Denied. The group being edited cannot take this action within this category. Calculated Setting. The effective permissions for the selected group in the category being edited.